Neemrana is a regal town of Rajasthan, located in the Alwar district. It is settled between the Shahjahanpur and Behror tehsils, and has now become an industrial hub. Neemrana used to be a hill fort occupied by the Chauhans till 1947. In fact, the former ruling family was considered to be direct descendants of the royal family of Prithviraj Chauhan! 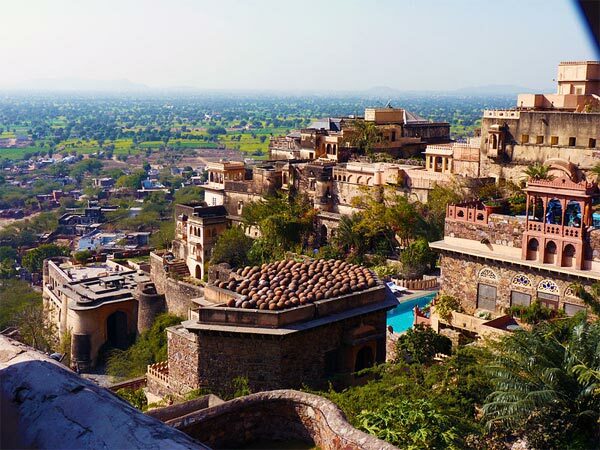 Neemrana is known as the "Golden Triangle", since it is situated at an almost equal distance (within 200 km) from the 3 major cities of Delhi, Agra and Jaipur. Hence, it makes for a great place of weekend getaway, especially from these 3 cities. The town is mainly famous for the Neemrana Fort Palace, the sole reason for Neemrana's historic aura. Located in the Aravalli ranges, the Fort Palace of Neemrana was built in 1464 under the reign of Prithviraj Chauhan. The architecture of the Fort Palace is exquisite and simply marvellous to say the least. It is an 11-tiered fort that covers almost 10 hectares of land. Apparently, Neemrana's successors were so proud of their lineage that they refused to bend according to the rules of the British. This ended in suffering for the rulers since the British divided the land and distributed it amongst Patiala, Nabha, Alwar and the other viceroys who were liked by the British. However, the grand palace stands strong till date to tell us the tales of its great rulers. Neemrana Fort Palace has now been turned into a grand hotel, giving people the experience of actually living the history! It is well-equipped, yet maintains the historic touch of the fort, giving an experience to the hotel residents like never before. There are activities such as zip-lining within the fort premise, an exciting experience that can be tried here. Since Neemrana is surrounded with green, it is relatively pleasant throughout the year. However, the ideal to visit Neemrana is between the winter and monsoon months of July to March, when the climate is cool and breezy. Monsoon brings very little rainfall, thus the town will be refreshing to visit in this season as well. Apart from the Neemrana Fort Palace, there are a few other places of interest around the town that cannot be missed. Sarsika National Park is mainly a tiger reserve, that covers an area of 800 sq km. The place serves as a perfect blend of history and wildlife, since it is not only home to a number of animals, but also houses ruins of ancient temples, that dates back to the 10th century. Apart from Tigers, the National Park is home to animals such as Four-horned Antelope, Chital, Hyena, Macaque, Leopard and Langur to name a few. Apart from these animals, the park is home to the largest number of Peafowls in India, along with other birds like Golden-backed Woodpeckers, Treepie, Bush Quail, Indian Eagle-owl, etc. Alwar Fort, also known as Bala Quila, was built by Hasan Khan Methi, back in the 15th century. Perched on the Aravalli Ranges, the Bala Quila is a huge fort crowns the town of Alwar, and is stretched across an area of 5 km in the direction of North to South and approximately 2 km across East to West. The fort was under the reign of great rulers like the Marathas, Kachwaha Rajputs and Yadavas. Since overlooks Alwar from an elevation of about 1000 ft, it gives a majestic appeal to the town. The fort consists of 6 six gates, 15 large and 51 small towers altogether, and is connected to the city through a single metalled road. After visiting these places, you may also stop to shop at Neemrana since it has famous items of Rajasthan such as the Ghagra Choli, exquisite handicrafts and beautiful Rajasthani-style gift articles. By Air: Located at a distance of 104 km is the Indira Gandhi International Airport in Delhi, which is the closest air-base that is well-connected to all the major cities of India such as Kolkata, Bangalore, Hyderabad, Mumbai, etc. Airport taxis are available in plenty from here. By Rail: The major railhead located close to Neemrana is the New Delhi Railway Station, located 117 km from Neemrana. It is connected to major cities like Lucknow, Pune, Kolkata, etc. Rewari district has a closer railway station located 39 km from Neemrana, and is connected to neighbouring cities like Jaipur, Delhi and Gurgaon. By Road: Since Neemrana is located close to the Delih-Jaipur highway, all the local and inter-state buses running through this route make a stop at Neemrana. So buses from within the state and neighbouring cities are available. Taxis can also be hired from airports and railway stations.